Growing up in Iran, Shokufeh Kavani was only nine when the 1979 Islamic Revolution took place. The eight year Iran-Iraq War had a deep impact on her and at the age of 19, Shokufeh started painting in reaction of the events happening around her. 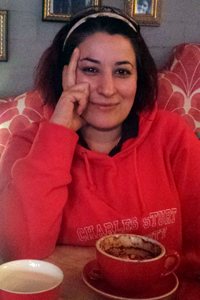 After migrating to Sydney in 1997, Shokufeh studied a Bachelor of Nursing at CSU as her Iranian nursing qualifications were not recognised in Australia. Studying via distance education meant that she could work while completing her degree. During this time, Shokufeh continued painting and in 2003 had her first solo exhibition entitled Persian Graffiti. After the 2005 Cronulla riots, she joined the art group "TAH, Art for Humanity" and participated in 12 group exhibitions all over Australia to raise awareness against racism and support Afghan widows and orphans. Shokufeh has been nominated for the Australian of the Year Award four times, in 2005, 2007, 2008 and 2013, and also for the Pride of Australian Medal in 2005 and 2007 for her humanitarian efforts. Completing her Graduate Diploma of Genetic Counselling with CSU in 2013, Shokufeh continues to work as a nurse and is pursuing her dreams to one day become a professional artist. I was not the first in my family to attend university. My sister, Maryam, was the first who became Number 8 in the nationwide university entry exam in Mathematics, and then I entered the Bachelor of Nursing, which encouraged my brother who now has a PhD from Leiden University in the Netherlands. The rest of my family – nieces and nephews – are currently enrolled in a university course. I’m currently working as... an operating theatre nurse and intend to study further, probably in Genetics but I haven’t decided yet. I have other passions as well, painting and translations (from my mother language Farsi into English and vice-versa). I have had several painting exhibitions in Australia and overseas and have won EDNA RYAN Awards. I have also published two books in Iran and am waiting for the third book to be published. At school... in Iran I was always the top student and very popular with students and teachers , because of my family history in school and also my own marks and good manners. I always enjoyed the privileges of being a top student like not wearing the school uniform but after the 1979 Islamic Revolution in Iran, wearing a head scarf and dark coloured uniforms became compulsory. I had to wear them like everybody else (although nobody liked them). My childhood was... very beautiful , filled with vivid and brilliant memories of hanging around with my only brother and five sisters who loved me to death, took me everywhere and looked after me. We had a very kind and hard working father and young mother who enjoyed the privilege of having bright children. We were not very rich but we were a happy family. My best memories were made during my childhood in the historical suburb of Tehran called Pamenar. As a child, I was most curious about the world... everything really. Coming from an educated family, my father was always listening to the radio and was buying us books (instead of toys) and encouraging us to get out there and experience the world. I was only nine-years-old when the 1979 Islamic Revolution happened in Iran which exposed us to so many different ideologies and then the eight years war between Iran and Iraq, which made us curious about everything which goes on in the world , in order to find out what was finally going to happen to us!!! I chose CSU because… it gave me the opportunity to study by distance. I had to work as a single woman to support myself – as I still do. My nursing degree from Iran was not accepted here so could not work as a registered nurse straight away but wanted to get my degree back. CSU gave me the opportunity to study while I work. I loved it and appreciate this great chance in my life. My best experience at CSU... I loved the residential schools as they gave me the chance to meet my classmate and lecturers. It was really like a good holiday - a break from work and getting in touch with the academic society, which I am very fond of. I loved the food, as well, especially the breakfasts! My worst experience at CSU... To be honest, I did not have a bad experience. I met lots of fantastic people and had lots of fun. The lectures were great and very academic and among them, there were some extraordinary and brilliant people which I will never forget. I found it difficult to speak of my homeland memories and experiences in the classroom or even in my assignments. I think we have to have more awareness of migrant students, their experiences and their needs for sharing these experiences. At university I was inspired… by all these fantastic people who I met and every single individual taught me something valuable. Today I’m motivated… to do more in my life and art. I read once somewhere that, “You live only once, but if you live it right, once is enough”. In my profession it is important to… keep focused, passionate and confident. I never dreamed I would… be a painter. Here I am, a modern artist, but I’m still not exactly where I want to be... I dream of that day. The biggest influence in my life... was my sister Maryam, my best friend Farhad, Mrs Shahrnush Parsipur, a famous Iranian writer, cinema and literature. I’m most proud of… being an artist. It is so liberating to find your own language by creating something unique which other people can also understand and feel connected. Art gives me a tool to say what I like to say by creating something unique. The language of art is so liberating. My greatest achievement is... coming to Australia, publishing two books, having several exhibitions and studying Genetics. In the future I’d like to… be a famous professional artist and travel the world. The best piece of advice I ever received... be yourself. Live your own life and don’t worry about what other people think. One day, they all will be proud of you because you followed your dreams. Paolo Coelho, a Brazilian writer has given lots of great advice in his brilliant book, Alchemist. The single-most important issue in the world is… humanity. The thing I wish I had done but never got around to... studying medicine. One last thing... Always be true to yourself. Be brave and bold and follow your own dreams. The heart knows everything. Listen to it and don’t be afraid to ask “why?”.